Simon Blow is the author of numerous books, DVDs and Audio CDs about the ancient Chinese healing arts. A near fatal accident at the age of nineteen lead Simon to investigate different methods of healing and rejuvenation a path he has followed ever since. He has been a full time professional teacher (Laoshi) since 1992; he has received training and certification from Traditional Hospitals and Daoist Monasteries in China and has been given authority to share these techniques. Simon has been initiated into Dragon Gate Daoism and given the name of Xin Si meaning Genuine Wisdom and is an initiated student and 29th Generation of the Da Yan Wild Goose Qigong. He also is a Standing Council Member and Deputy Secretary of The World Academic Society of Medical Qigong, Beijing China. Simon was invited to teach at the Little Bay Coast Centre for Seniors in 2002 and has been leading regular classes ever since. He is a specialist teacher and has been working for over thirty years to help people find peace and improve their quality of life. 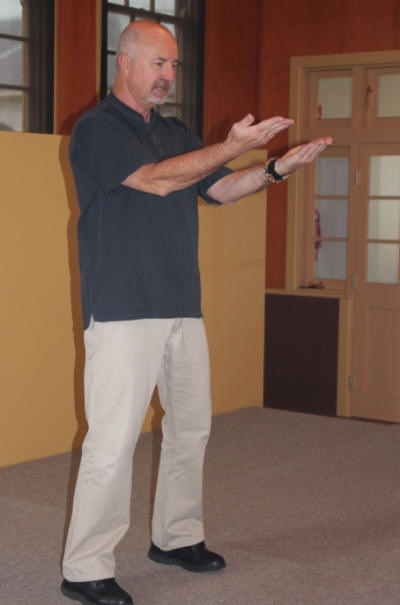 Simon has been teaching stress reduction programs using Qigong methods at We Help Ourselves (WHOS) a drug and alcohol rehabilitation centre since 1992 and also for Mission Australia and the Salvation Army. He has been training health care professionals to incorporate traditional healing techniques for the Health Dept in NSW and QLD and has been leading groups at the new Chris O’Brien Lifehouse at RPA Hospital since its establishment in 2013. Simon conducts many retreats and workshops throughout Australia and has been leading unique study tours to China since 1999.